Galbally’s singing teenage sensation and born entertainer Lauren McCrory is hoping to get the entire county of Tyrone and the wider Mid Ulster area behind her in her quest for country music stardom. 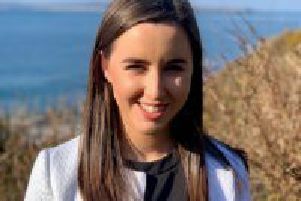 The 19 year-old is the latest Tyrone contestant to take her chance on the popular TG4 series, Glór Tíre, and is hoping to book her place in the final. Lauren made her first appearance on Glor Tire in January and was picked by Omagh singer and mentor Barry Kirwan following her impressive audition performance. A student of Language and Linguistics at the University of Ulster, she is passionate about acting and being on stage, and is a member of the Craic Theatrical Group where she rehearses every weekend. A self-confessed country music superfan, she is eager to win votes in order to pursue a country music career. “The singing is the easy bit,” she told the Tyrone Times. “I’ve really had my eyes opened to the amount of effort it takes to publicise yourself and travel from gig to gig. “We’ve literally covered all of Tyrone with posters, and honestly, I had no idea how big the county is. “I’ve been joining my mentor Barry at all of his shows, singing a few numbers and then doing the duet, which has been a wonderful experience. It’s been great to have a full band and singers behind you, and the responses from the audiences have always been so heart-warming. However, there have been sacrifices, too, as Lauren, who has had success at local singing competitions, pitches for wider recognition of her talents. She said she has been overwhelmed by the support, and in particular from other singing stars such as Andrea Begley. You can vote for Lauren by texting “GLOR8” to 60999 or call on 09016566108. Or you can download the app and get five free votes. The Glor Tire app is available for download for free from the Apple & Android stores.